Take lead nitrate solution in test tube. Add potassium iodide solution to this. (a) What is your inference ? Objective – A chemical reaction characterized by formation of a precipitate. 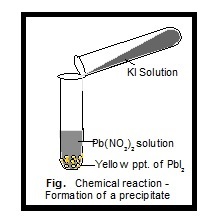 Inference – When potassium iodide (KI) solution is added to a solution of lead nitrate [ Pb(NO3)2 ], a yellow solid compound (or precipitate) of lead iodide and a colourless potassium nitrate solution appear. Conclusion – A precipitate is a solid insoluble product which separates out from the solution during the reaction, characterises chemical reaction.